Ok can I just say that My Minds Eye killed it when they designed this year's Halloween collection! ?! Every piece of it is Something Wicked! My mind was reeling with creative possibilities when my I Want It All Bundle arrived from FotoBella.com. Frameables art is part of this collection and makes it really simple to make into decor. I took the "It's the Wind and Nothing More" piece and framed it with a black 8"x10" glitter frame that I had picked up on clearance at Michaels over the summer. I knew I would need that frame for something! 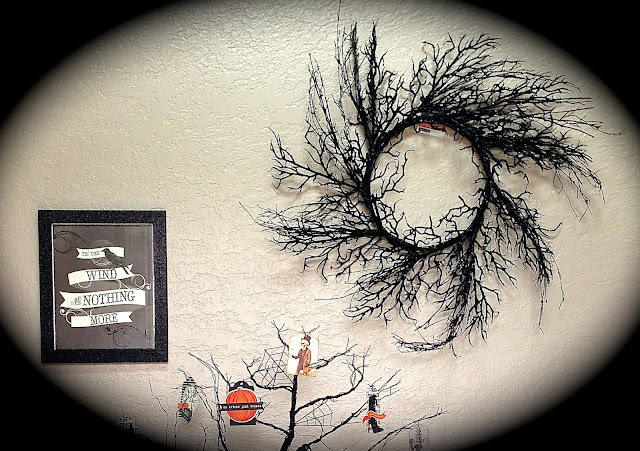 Paired with this twisted black wreath looks spooky on the wall together. Next up on the decor list is candles. I have a ton of these vanilla colored LED candles. 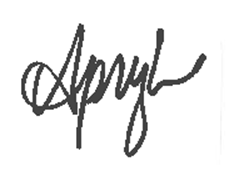 They are great for because they go with everything and easy to alter for any occasion. 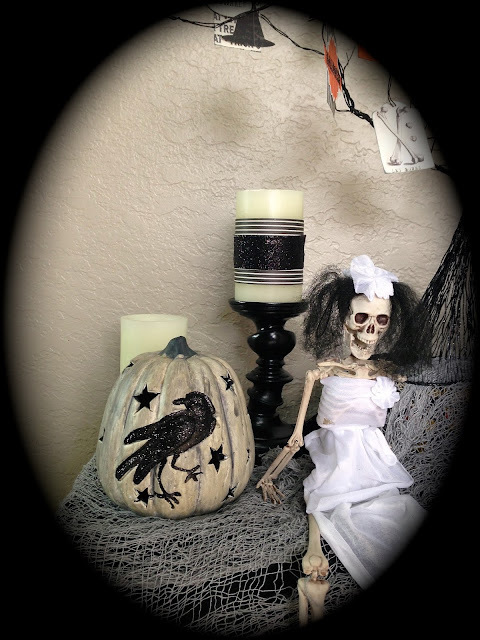 For this candle, I chose the Black Tie Bones Elixir sticker from the Something Wicked Sticker Labels. I matted the sticker with dark red card stock and fussy cut it out. For anther candle, I cut a strip of "Going Batty" paper approximately 3 inches wide and the length to wrap around the candle. I added a black glittered ribbon tied around the paper strip. Here's another fun one! 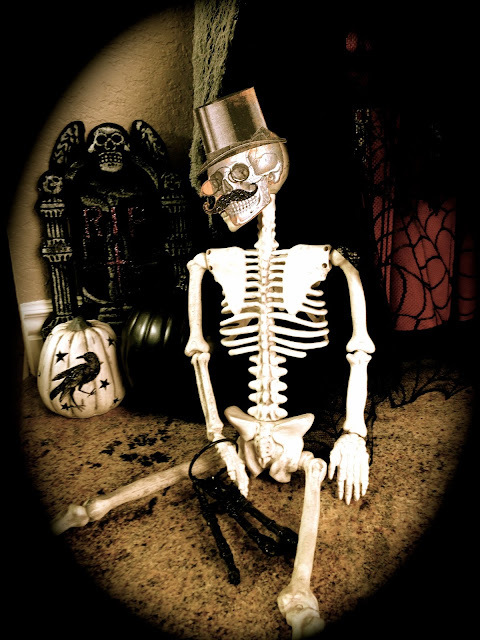 The skeleton I had in my decor stash. I think I got him a couple years ago from Target. He needed a fresh face! I just love the Top Hat and spectables look, who doesn't like a good mustache? This guy is stylin' now. I fussy cut this classy skull face from the "Bootacular" paper. Here's how the whole look came together. 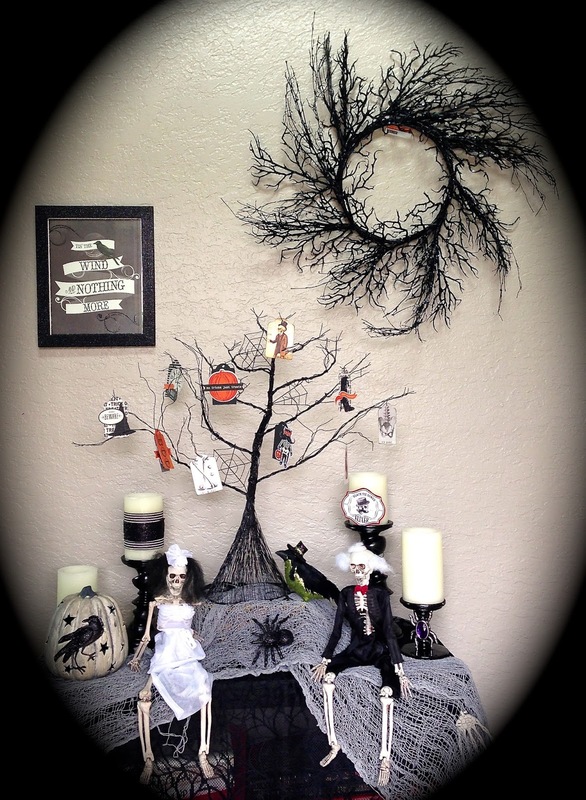 How will you decorate this Halloween? Visit FotoBella.com for some great product to get started with. Something Wicked perhaps?